Other ingredients: Microcrystalline cellulose, Stearic Acid, Calcium Silicate, Croscarmellose Sodium, Magnesium Stearate. Suggested Use: 1 tablet daily or as directed by a veterinarian. Zobaline for cats: Don’t let nerve damage ruin life for your diabetic cat. Zobaline is the new cat-specific version of our popular Xobaline product, made without fructose or any other sugar-based flavors. needing to rest more after short walks. 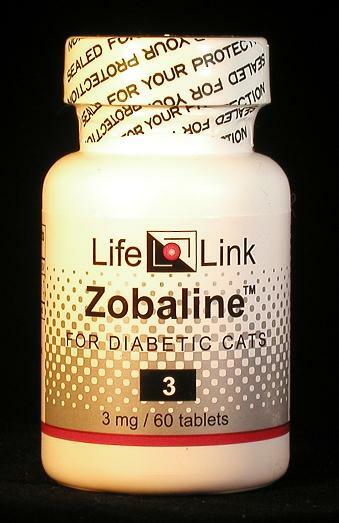 Many cat lovers are treating their diabetic pets with Zobaline. One 3-mg tablet of methylcobalamin administered once per day is reported to reverse most or all of the symptoms of feline diabetic neuropathy within a few weeks. Diabetes afflicts animals as well as humans, so it’s not surprising that cats can also suffer from diabetic neuropathy.1 As in humans, diabetes in cats is caused either by inadequate production of insulin by the pancreas (Type 1 diabetes) or by impaired response of cells to insulin (Type 2 diabetes). Although diabetes can strike cats of any age, it occurs most often in older, fatter animals. Diabetic neuropathy in cats is characterized by symptoms such as progressive weakness in the hind legs and walking on the hocks (the back part of the legs) rather than on the toes.2 Cats so afflicted become incapable of climbing stairs or trees and lose the ability to jump to higher surfaces. Often they can’t take more than a few steps without the hind legs sliding out from under them. Cats with neuropathy also seem to tire quickly and tend to rest more often after taking short walks. Many cat lovers are treating their diabetic pets with Zobaline.2 One 3 mg tablet of methylcobalamin administered once per day is reported to reverse most or all of the symptoms of feline diabetic neuropathy within a few weeks.3 Zobaline was designed specifically for feline use. Although LifeLink is not in the veterinary business and cannot promote the use of Zobaline for veterinary purposes, we’re proud that Zobaline has been singled out as a useful supplement for cats. Average Customer Rating: based on 23 reviews. Write a review. Excellent product - Ronin is so much happier! Our pure white (and deaf) cat, Ronin, developed diabetes a few months ago - he was having a hard time walking, grunting when he laid down and just looked at the stairs with complete disdain when we moved to our new house- didn't want to bother even trying them. After i took him to the vet (since really, that was odd behavior for him since he is usually into EVERYTHING) our vet suggested we try Zobaline when he was diagnosed. And I know for sure that between the two (insulin/diet change and the little pill) our sweet boy is back to his old self. He is getting up there (16 now) but you couldn't tell with how much he loves to run around and cause the havoc he did when he was younger. That is a part of him i missed when he was sick - deaf kitties just have no clue they are making the biggest racket on the planet :) and i LOVE that he is doing that again. THANK YOU! Also wanted to mention - i also give him the daily pill in a pill pocket - what is great is he badgers me to give him that since it is really his only 'treat' now. Gobbles it up, doesn't even bat an eye. My cat was diagnosed with diabetes and had terrible diabetic neuropathy. Wobbly legs and head tilted sideways. Within a weekly he was noticeably better. Then he went into remission, after changing his food to the Classic fancy feast. I read it could take 3-6 months for the neuropathy to go away. After 2 months on Zobaline he is almost back to normal. We grind up a pill in his bowl and add food and mix. The pill turns a reddish color but he has never balked at eating his food. I chewed one up and it was tasteless to me. I cannot recommend this highly enough. It was like a miracle for our cat! I have two diabetic littermates. They are the center of our household. Frank, my orange Hemingway, was diagnosed first. He was showing little to no improvement concerning his neuropathy. The vet told us he probably would never get better and if he did it would be a years long battle to get him rehabilitated. Within one month of starting him on Zobaline he was walking normal again. Within a few months he was standing on his hind legs and purring again. It has made such a huge difference in his quality of life that it brings tears to this pet mommy's eyes. Seeing how well it work with Frank, we began giving it to our other cats just for precaution. When our second cat was diagnosed with diabetes it prevented him the pain of neuropathy and helps us better control his sugar. Thank you Life Link! I feel confident in saying the Zobaline has made all the difference in relieving her neuropathy symptoms. Thank you LifeLink for making this medication available and renewing hope for our "babies"! !